What is the role of a professor in the Lean movement? Is it to mindlessly cheerlead Lean and accentuate only the positive? Or, is it to think critically, carefully analyze the product (based on experience using the product), and identify practical improvements? My involvement with Lean management has focused on doing the latter – which, of course, is what professors should do (though many don’t). Thinking critically about Lean bothers many Lean advocates, and so I periodically receive e-mails from well-known Lean consultants and other important members of the Lean-industrial complex who are “concerned” about me and my work. Their communication with me follows the same pattern: They start out by saying they have a lot of respect for my work, then tell me how they dislike my tone — though never challenging me on the facts I present. They suggest I am jealous of others’ success and that I think I am the only one who understands Lean. They always say that they have heard other people say the same things about me. They end by saying or implying that I would be more effective if I just fell in line with everyone else. 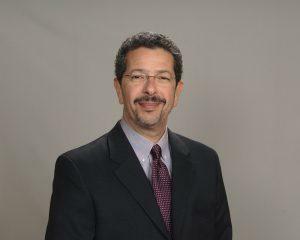 A professor’s role is to analyze the work of others, think, study, and contribute to the body of knowledge. This work necessarily functions from a negative perspective in order to make positive advancements in both knowledge and practice. The job is to identify gaps in knowledge and fill them in never-ending PDCA cycles. In my case, having decades of practical experience with TPS/Lean gives me a great advantage over other academics who possess merely book knowledge. The ultimate aim of my work is help people so that they can be more successful. By people, I mean both individuals and organizations; the people who created Lean itself and those who consume (i.e. practice) Lean. So I point out things that cause discomfort to those with vested interests in Lean’s success. For example, the creators of Lean missed a key component of TPS for about 20 years (1988-2008), the “Respect for People” principle, as well as its interdependence with “Continuous Improvement.” They did not understand Lean leadership and its importance in Lean transformation. And they did not understand the industrial engineering basis of TPS nor its market basis (buyers’ vs. sellers’ market). These gaps are incredibly consequential as they greatly reduced people’s ability to generate successful outcomes in their organizations. Importantly, these and other gaps have caused the Lean movement to be less successful than originally imagined — which is now widely acknowledged among Lean movement leaders in part because of the pressure that my work has put on those whose mission it is to advance Lean. I often relate my own experiences with TPS and Lean and passionately argue in favor of the practices that I learned from Shingijutsu. I speak from a position that is the combined result of first-hand knowledge and practice in an effort to correct underperformance. I am not driven by base motivations such as jealousy or money. My role as a professor — the helping profession of teaching — differs from others, and therefore my contributions to Lean are different. Unfortunately, there remains little room in Lean world for facts and views that differ from the party line. I am an independent voice, free of conflicts of interest (which entangle nearly all others) so that I can serve the Lean community at-large. There may be no one else in Lean world who can say that. Graham’s Hierarchy of Disagreement. Click on image to enlarge. Over time, I have found that people, especially those whose incomes or personal success is based on Lean, consistently misunderstand my critiques of Lean by a wide margin and also mistakenly view them as ad hominem attacks (see image at right). 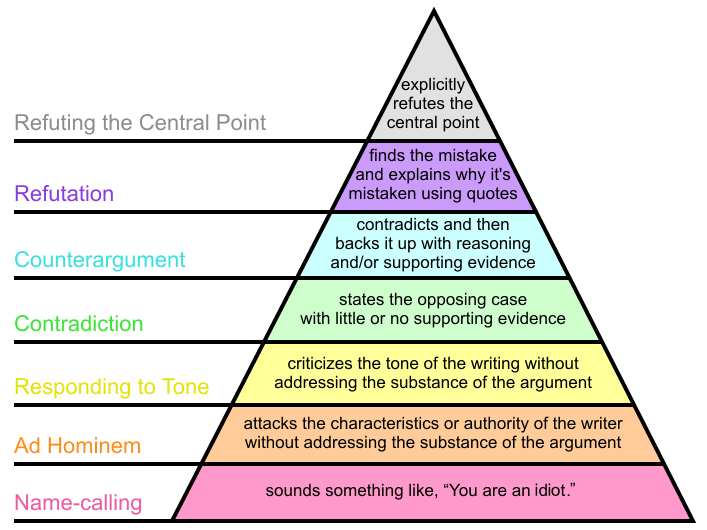 But in fact, my critiques are always rooted in counterargument and refutation (top three layers of the pyramid). 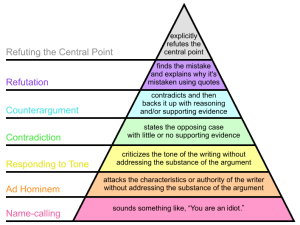 Unfortunately, criticism of my work always originates in the bottom four layers of the pyramid, which does nothing to help me improve my work. Such feedback is worthless. Truly, I expect better from people who have graduated from the best schools in the world and who claim to be excellent critical thinkers, capable of formulating and defending fact-based arguments. This suggests to me that their concerns about my work are political, not factual. To sum up, I don’t worry about what others think. If I did, there would be less progress and slower progress towards getting to the truth. That’s how professors think, and that’s what professors do. To view my contributions to the body of Lean knowledge and practice, click here for research papers, here for books, and here for blog archive. I am of the same philosophy. Lean, as many apply it, missed the mark on many TPS principles designed toward culture improvement. I think folks like us are vital to the Lean movement, but as you rightly noted, we may be very disliked based on the others’ worldviews. Isn’t it odd that open-minded Lean thinkers are so closed-minded to the flaws in Lean? People devoted to improvement are not happy when someone points out the need for improvement in Lean itself. Bob I respect your work a lot. Critique is always the key to the door of next level Kaizen. I agree that counter-argument is the way to find the best solution without having any emotional attachment because it is backed by reasoning. Purely it based on rational and according to the preconditions of the genba not based individual’s choices or taste. Only caution when doing counter- argument is to have the open mind and ready to change our opinion if we find a logical point in others opinion. I learned a lot from my sensei by counter-arguing and asking hard questions. My senseis are so responsible that even my counter-argument is illogical they took time and patience to make me understand the right way and at the same time they are flexible to change their opinion if my point make sense. My sensei always says “We are business company not doing a volunteer job. TPS is make sense go ahead”. Bob you are making a sensible hard questions to the lean community. I am sure lean people who is willing to learn and have open mind will take your points in their advantage. Keep going. Thank you. Thank you Manikandan. The problem, as you can see, is that counter-arguments to my arguments have not been offered. Thank you Lisa. I will keep at it. More good stuff to come. There is a parallel between your misunderstood position within the greater lean community, and those stuck within classical management systems. You have something in common with those you’re trying to help. You hold an unpopular position, and likewise, those unable to make suggestions and receive meaningful responses, due to establishments beyond their control, face the same situation. I think the lesson is to hold up the scientific method, and stand up for the truth regardless of the popularity contest happening around you.